Allium tricoccum is an ephemeral, perennial wild garlic in the onion family that’s native to eastern North American woodlands. Better known as ramps, the plant's greens and bulbs have gotten quite popular in the culinary world over the last decade. Their distinctively delicious flavor (akin to garlic), combined with their short season (they are usually only available for about 6 weeks) make them highly sought after this time of year. 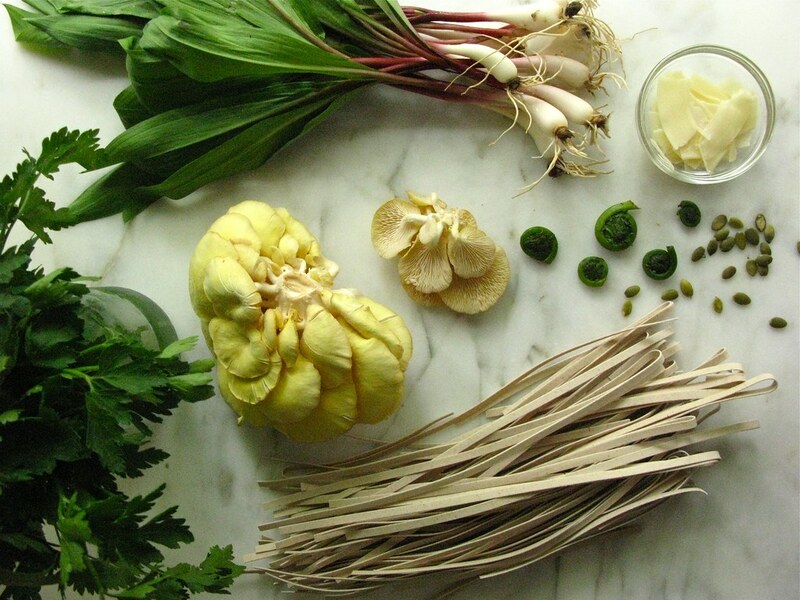 More: Learn about harvesting wild ramps. This recipe makes about one cup of pesto and includes parsley to mellow the flavor. It freezes well if you wish to make a batch for later in the year when ramp foliage will have long since senesced. Simply omit the cheese and fill an ice cube tray with the prepared pesto. Freeze overnight, then remove the cubes from the tray and wrap individually in waxed paper before sealing in a plastic bag and placing in the freezer. When you are ready to use, thaw and add the omitted cheese. The frozen pesto will keep up to six months. *Due to their popularity, ramps have the potential to be overharvested from the wild. They are slow to germinate from seed and take anywhere from 5 to 7 years to mature. With this in mind, when purchasing, ask your purveyor if they have been conscientiously cultivated or harvested sustainably from the wild. If they are unable to answer reliably, it is best to buy from a vendor who feels confident in their sourcing. While preparing the pesto, cook and drain the pasta, reserving a few tablespoons of cooking liquid, and set aside. Slice the white bulbs of the ramps from the leafy green leaves and coarsely chop. Reserve half the bulbs and place the rest in a skillet with a tablespoon of olive oil and sauté for 3 to 5 minutes on medium-low heat. Add the leaves and cook just until wilted, about another 1 to 2 minutes—you do not want them to brown. Remove from the heat and transfer to the bowl of a food processor. Add the remaining olive oil, parsley, pumpkin seeds, cheese, lemon juice, zest, and ¾ teaspoon sea salt. Process until smooth, scraping down the sides as necessary. Toss with the cooked pasta, drizzling in a tablespoon at a time of reserved cooking liquid to help coat the pasta with the pesto. Keep covered in a warm spot. Place the remaining ramp ends, fiddleheads, and a generous pinch of salt in the same skillet and sauté over medium heat for 5 to 7 minutes. (Alternatively, you may steam the fiddleheads separately if you wish to retain their bright green color.) Add the oyster mushrooms and cook until they soften, about 3 minutes. Pour in the wine and cook for another 3 to 5 minutes. 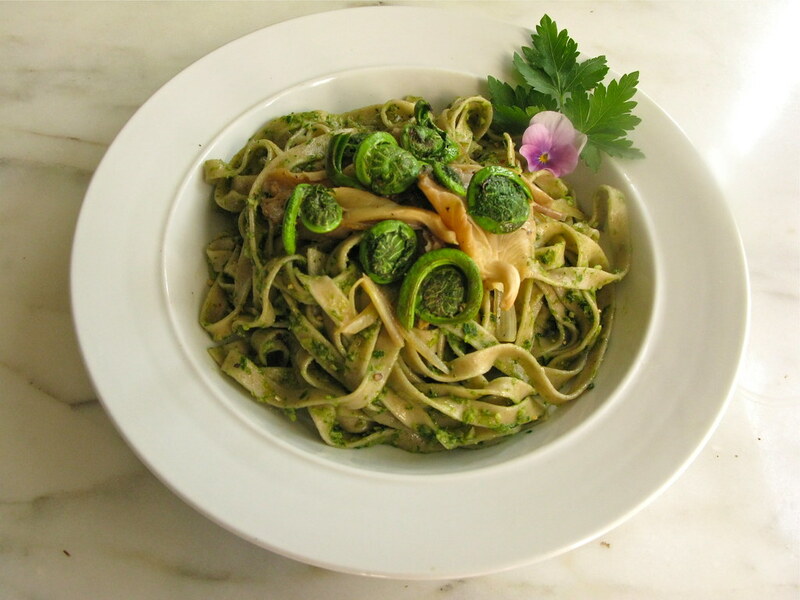 Remove from the heat and plate the pasta, adding the sautéed ramps, fiddleheads, and mushrooms on top. Garnish with additional parsley, cheese, and freshly ground pepper. 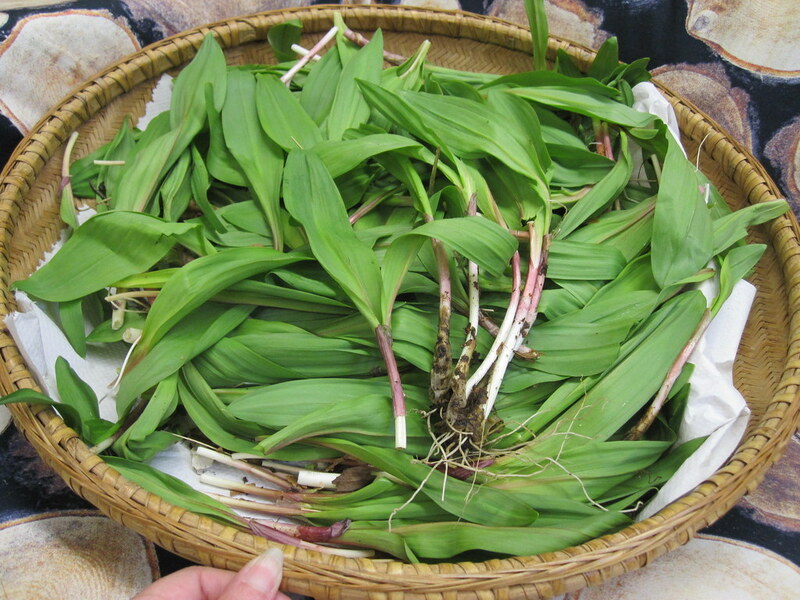 Ramps (Allium tricoccum), also called wild leeks, grow in the Catskills and other eastern mountainous woodland areas. They are in season for only a short time in early spring. Photo by Sarah Schmidt.